A worshipful intermediate solo by teacher and church pianist Christina Mathis. 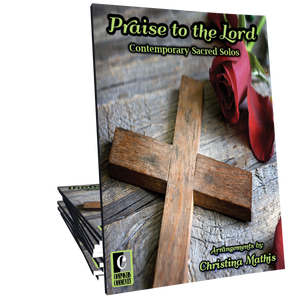 With its lyrical melody and full chords, this piece will enhance any worship service or recital. This arrangement is WONDERFUL!!! I am looking forward to playing it at my church. I really like the layout of the piece. It starts with a beautiful section composed by the arranger that is lovely and very easy to listen to. The first arrangement of the hymn is a simple, quiet one that is so worshipful. The beautiful introduction is repeated and then the piece builds to a majestic section that is very powerful. Then, the the piece closes with a section very similar to the beautiful introduction. This will be a great piece for using during the Easter season or Communion service. Very nice job, Christina Mathis. I used this one on Maundy Thursday, and it was a perfect "fit." Christina Mathis should keep cranking out hymn arrangements! Church musicians, take note!